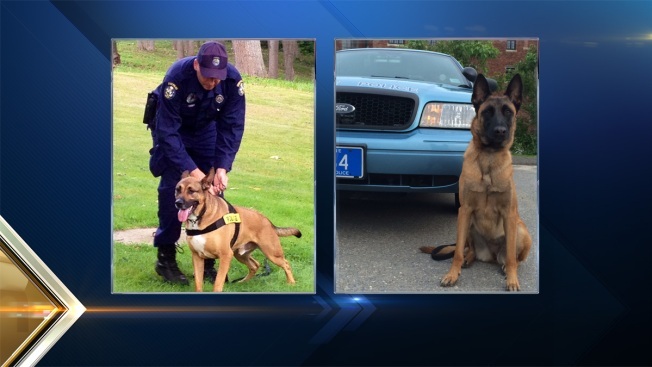 Maine State Police are applauding the efforts of Mass.-based Vested Interest in K9s, Inc.
Two Maine State Police dogs are being awarded bullet and stab-protective vests thanks to the efforts of a Massachusetts-based non-profit organization. Vested Interest in K9s, Inc. of Taunton, VPI Pet Insurance of Brea, California, and Sorrento resident Madeline Hamersley provided funding for the two vests for Champ and Merry. Maine State Police have all of their patrol canines equipped with vests. Champ and his handler, Trooper Jeremy Forbes, patrol York County as part of Troop A. Champ is also a certified drug detection dog. Merry and his handler, Trooper Jared Sylvia, patrol in Aroostook County as part of Troop F.
The program is available to U.S.-employed and certified law enforcement dogs that are at least 19 months of age. More information is available here.